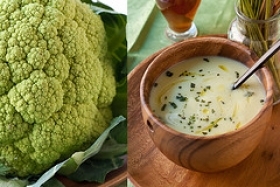 Have you made Broccoli And Cauliflower With Germatola Crumbs? 1. Place steamer basket in 6-8 qt saucepot with 1\" water. 2. Heat water to boiling over high heat. 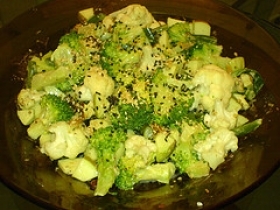 Add cauliflower and broccoli; reduce heat to medium. 3. Cover and cook until vegetables are just tender, 5-7 minutes. 4. 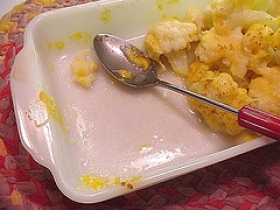 Remove vegetables and rinse under cold running water to stop cooking; drain well. 5. 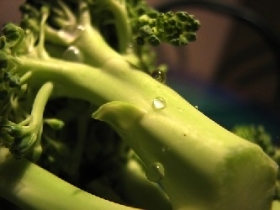 Place vegetables in large self-sealing plastic bags and refrigerate up to 1 day. 6. Preheat oven to 350 degrees. Place bread pieces in 15 1/2x10 1/2 jelly roll pan. 7. Toast bread pieces until light golden, about 10 min; cool. 8. Store in tightly covered container until ready to serve. 9. To complete, preheat oven to 400 degrees. From lemons, grate 1 tbsp peel and squeeze 3 tbsp juice. 10. In 2 qt saucepan, melt butter with olive oil over med-lo heat. 11. Add garlic, salt, pepper, lemon peel, and 1 tbsp lemon juice. 12. Reduce heat to low; cook 1 min to blend flavors. 13. 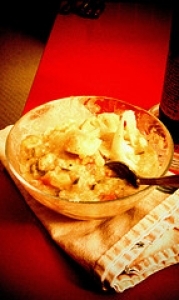 Place vegetables in lg bowl; toss with half of butter mixture. 14. 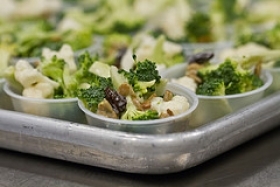 Transfer vegetables to 13x9 glass baking dish. 15. Cover and bake vegetables 20 min or until heated through. 16. Meanwhile, in same large bowl, toss toasted bread pieces with half of parsley, remaining butter mixture, and 2 tbsp lemon juice. 17. 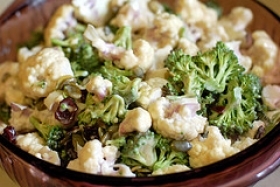 Uncover vegetables; top with seasoned bread mixture and bake uncovered 5-7 min longer, until crumb topping is crisp and browned. 18. Sprinkle with remaining parsley. Makes 12 side servings. This recipe contains potential food allergens and will effect people with Wheat, Lemon, Butter, Gluten, Garlic, Olive Oil, Citric Acid allergies.